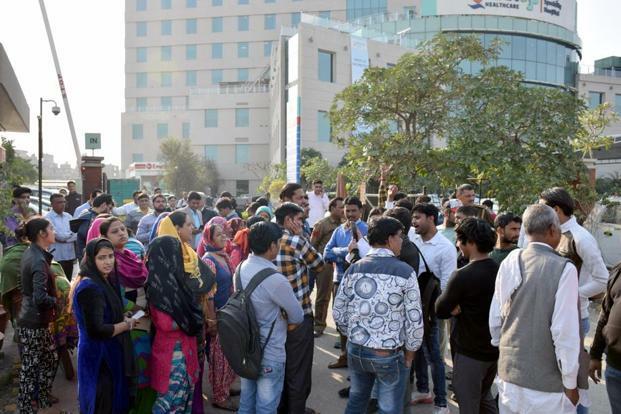 New Delhi, Dec 10: Employees of Max Hospital here, whose licence was cancelled by the Delhi government, burned effigies of Chief Minister Arvind Kejriwal and Health Minister Satyendar Jain outside the hospital on Saturday afternoon, police said. The protestors claimed that they lost their jobs due to the government action, he said. Earlier in the day, patients who came for treatment also protested outside the hospital after the hospial denied them admission them. On Friday, the hospital's licence was cancelled with immediate effect, after it erroneously declared a new born dead last month. The hospital cannot admit new patients and can only continue treatment of patients who were currently admitted, according to the government order. The baby boy was declared dead by Max Hospital on November 30 and handed over to the parents in a plastic bag, along with his still-born sister. However, the newborn started moving while being taken for burial. The baby was later admitted in a clinic in Pitampura, but died on Wednesday.